*Includes ONE (1) FREE GALLON of FOG JUICE to get the party rolling right out of the box!!! 400 watt down-sized, metal construction, fog machine with wireless remote. New design is much lighter and easier to handle. 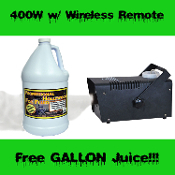 Fog machine can be activated with included wireless remote from up to 30 feet away! *Note: Compatible with all of our Animated Fog Accessory Props. This is a regular fogger, NOT a low-lying fogger. Compatible with all of our Animated Fogger Machine Accessories, such as Groundbreaker Fogging Ghoul, Bilious Zombie, Spewing Corpse, Wretched Reaper, Demented Demon, Smokey the Clown, 5-foot Standing Reaper... and our Deluxe Life Size Standing Prop: Zombie Reaper PESTILENCE!!! ***YES- This item ships Worldwide!!! ***, however, it is made for use with *USA voltage.